One of the most popular models of Range Rover around has to be the Evoque. Debuting in 2011, it has since gone onto achieve sales well over the 600,000 mark. Popular with a wide range of motorists, its sporty look and practical features make it suitable for a lot of different tasks. Whether you use it on dusty country roads or in busy city traffic, an effective car grille is needed to protect the engine bay. Here at Zunsport, we have the latest Evoque Prestige black gloss grille with silver trim ready to purchase! The Evoque demands custom car grills that look the part. This Prestige black gloss car grille is perfect for achieving an upgraded look with its striking finish. It allows for a simple and quick way to upgrade your Evoque to the 2016+ Prestige Facelift model. The black gloss finish catches the eye and the stunning silver trim matches perfectly for sublime visual impact. This car grille upgrade will fit any Evoque models manufactured between 2011 to 2018. As usual with our custom grilles, the durable materials used means it will last for a long time – possibly as long as the car itself! Tough ABS plastic gives this Range Rover grille enough strength to handle any driving conditions. Although not a genuine Land Rover part, the plastic used is exactly the same but gives much better overall value at only £94.95! 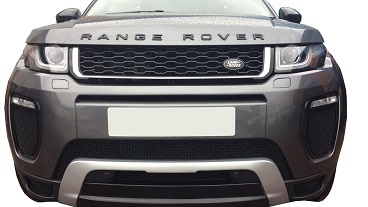 This car grille looks even better if you take the Range Rover badge off your old one and fit it to this new upgrade. It takes roughly 20 minutes to fit in place and no tools are needed. The grille simply hooks into place. When you order this Range Rover Evoque part from Zunsport, you get 1 black gloss grille with silver trim in the box on delivery. As with all cars, a quality car grille is key to protect the engine on your Evoque from outside elements. They also give any vehicle a smart, stylish look. Contact Zunsport today or call into your nearest store for more details on how to pick up your new Evoque Prestige black gloss grille with silver trim front.